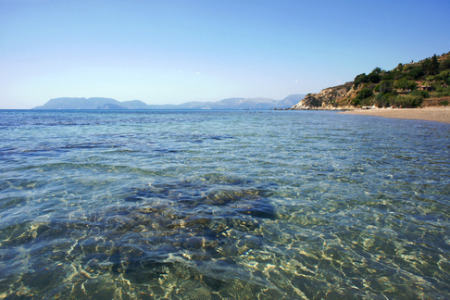 Alikes, also spelled Alykes, lies on the north-eastern coast of Zante where some of the island's best beaches are located. Alikes holidays are very popular with families attracted by the soft golden sands and safe bathing, and with couples drawn by the warm relaxed atmosphere. Holidays to Alikes can be taken from April until the end of October when the temperature ranges from twenty to the low thirties. If you are looking for a relaxed spring break or want a guarantee of summer sun, you may be tempted by our surprising number of cheap Alikes holidays. With good accommodation, they are considered to be excellent value for money. Holidays in Alikes are very laid back, where you can do as little as you want, but have the opportunity for sporting activities if you wish. Restaurants, tavernas and bars cater for all tastes, with traditional as well as international food being served. So, if you fancy dining under the stars while listening to waves gently lapping the shore, check out our low cost Alikes holidays and you could soon be on your way. For further information, and to discover our latest Alikes holiday offers, please use the search facility.